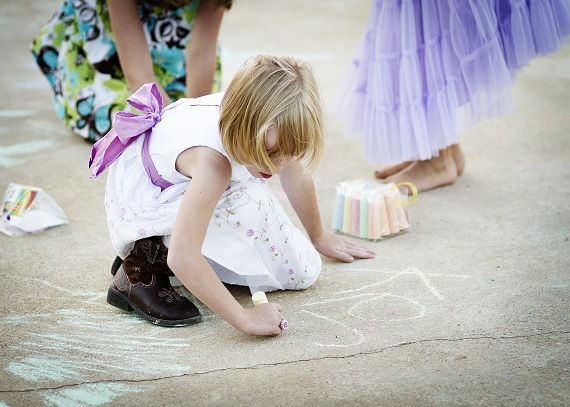 Wedding Plannning Idea: Create activites for the kids at your wedding. Everyone will be happier! As I talk to couples the question of “What are we going to do with the kids?” always seems come up. Couples want a beautiful stress free wedding and sometimes children, as adorable as they are, can mess things up and add stress. Well a little planning and preparation can create creative opportunities where kids add joy, beauty and positive energy to your wedding celebration. Delegate someone to supervise young wedding guests during the entire event. If children are sitting with their parents, this will be a simple role involving distribution of activity bags or books to kids upon arrival and handling any unexpected kid emergencies. Have a small first aid kit available. On Sunny Slope farm there is plenty of room so you can create a private “Kids Only” space, this position expands into a much greater role involving some pre-planning with activities limited only to your imagination. Fill a pinata with wedding treats, play musical chairs to wedding themed music, have a special cinema corner set up at the end of the pad or play bingo. Let children express their artistic ability by providing colored calk and they can color on the concrete pad. (YES that is ok with me. I will just spray it off at the end of the night.) Supply sleeping mats or blankets for the exhausted child who has fallen asleep during the evening or those who just want to lay out and gaze at the stars on the lawn. Ask family members or friends for names of trusted sitters. Hire a nanny or ask On Sunny Slope Farm and we can provide a babysitting service. Ask your church for an experienced nursery staff attendants or responsible teens from the youth group. Check out nearby universities for college students studying teaching and looking to earn some extra money. Inquire at local day care facilities to see if there are teachers available for hire during your event. Be certain to check references, referrals, and CPR certification before employing any child-care worker. Either under the tent or out on the pad, arrange a small game tables for older children.Puzzles, playing cards, and board games will be popular with pre-teens and teen-agers. For a more controlled environment and less disruptions, seat children at their parents table. Kids are usually more behaved and less rambunctious when seated next to mom and dad rather than other children. This will also eliminate children from running between their own seats and their parents table throughout the event. The wedding activity bag will keep children quietly entertained and in their seats rather than racing around. Add a juice box, fruit bar, or crackers to each kids activity bag or place in them in the center of the kids table.Children can become cranky when hungry or thirsty and often do not have the patience to wait until the meal is ready to be served. Parents will appreciate your thoughtfulness at providing snacks to hold them over. Ask for Kid Friendly meal options.Most caterers are willing to provide a separate meal plan for children. It will be less expensive for you and the kids will be happier with food they love. Some popular ideas include chicken nuggets, mini-pizzas, pasta, fish sticks, hamburger sliders, macaroni and cheese, and Jello. Request cups with lids and straws to avoid messy spills. Invest in fun by hiring a face painting artist, magician, or balloon artist.The performer can mingle among the tables entertaining guests of all ages. Or rent an inflatable lawn activity. Encourage the band or DJ to play songs that children will recognize and enjoy.Ask The Master of Ceremonies to announce a “kids only” dance. Have a dance off contest, a Dad and Daughter dance, or an opportunity to dance with just the bride and groom. These are great moments for the photographer to capture. When it comes time to write thank you notes, add a copy of these photos as a small gift to the parents. On Sunny Slope Farm there are 67 acres! Let us organize a nature walk around the farm. Kids will love the opportunity to run, stretch their legs and see all the farm animals. Take a hike back to the home place, bring seed and feed the chickens, guineas, turkeys, or white pigeons or some of the wild birds. Walk up to the top of the hill for a beautiful view and provide each child with a bottle of bubbles. All these are great photo opportunities. Maybe you have some Ideas that you would be willing to share with us. Please do! https://i1.wp.com/onsunnyslopefarm.com/wp-content/uploads/2013/04/Wedding-Celebration-on-Sunny-Slope-Farm-20.jpg?fit=1280%2C914&ssl=1 914 1280 https://onsunnyslopefarm.com/wp-content/uploads/2015/07/OSS-logo-WEB.png 2013-10-22 12:43:532013-10-22 12:43:53Wedding Plannning Idea: Create activites for the kids at your wedding. Everyone will be happier!